Over the last three decades, the War on Drugs has stripped people of myriad rights, blocked life-saving public health policies and created new social problems, such as housing and job discrimination. The negative consequences of criminalization are not felt equally, as communities of color and low-income people are much more likely to be targeted for drug-related law enforcement. Increasingly, New York has recognized that drug use is more effectively addressed through a health and safety approach, rather than a criminal-justice approach. One important example is Opioid Treatment Programs (OTPs), which offer methadone and buprenorphine (synthetic opioids) to people who are dependent on heroin and other opioids. Methadone treatment has been shown to be highly effective in reducing the risk of HIV and Hepatitis C Virus (HCV), drug overdose and incarceration while also improving a person's quality of life. In fact, nearly 30,000 New York City residents rely on methadone maintenance treatment to manage their dependence on heroin and other opioids. Policymakers and public health officials should devote attention to improving OTPs for several reasons. First, serious health issues affecting active and former drug users, such as HCV and overdose, can be mitigated through effective methadone programs. Second, drug-policy reforms have diverted people into treatment programs over prison. Third, growing interest in reducing Medicaid spending has drawn attention to effective treatments for drug use and related harms. Lastly, the New York Office of Alcohol and Substance Abuse (OASAS), the state oversight agency, may soon be consolidated with other state agencies, opening up the possibility for review of its programs. 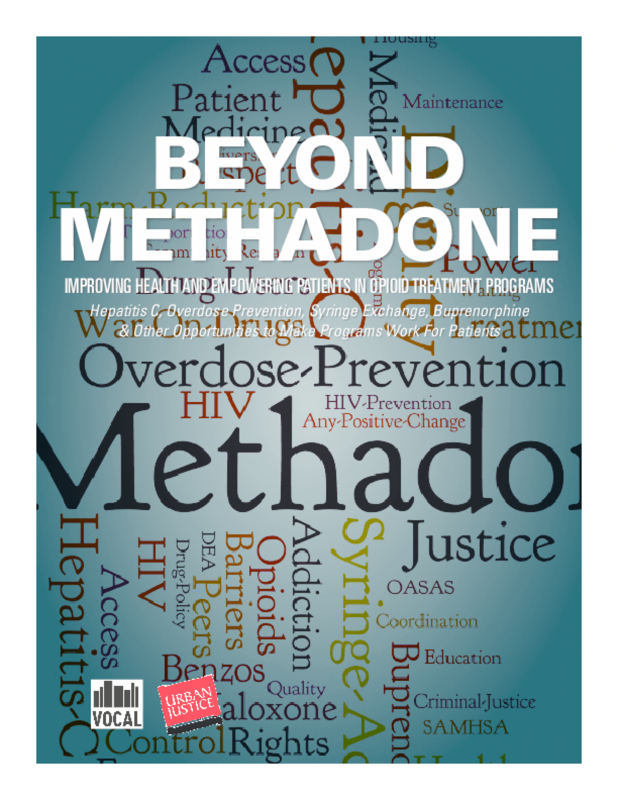 While methadone can reduce government spending and improve public health, VOCAL New York (VOCAL-NY) has identified a number of concerns related to the provision of care at OTPs in New York City. Accordingly, with the research support of the Community Development Project (CDP) of the Urban Justice Center, VOCAL-NY conducted the current study to gather detailed data from the perspective of OTP patients on the key challenges and opportunities for OTPs in New York City. Copyright 2011 Community Development Project at the Urban Justice Center, VOCAL New York (VOCAL-NY).